First-year women’s basketball head coach Tracy Sanders has announced her staff for the upcoming 2018-19 season, including two Southern Utah University alumni. Tony Giannotti graduated from SUU in 2000 after a two-year playing career for the Thunderbird basketball team. After earning his degree, Giannotti served as an assistant coach for the Southern Utah men’s team during the 2000-01 season and for the Lady T-Birds from 2003-06. Since then Giannotti has served as an assistant coach on women’s basketball staffs at Saint Mary’s College, New Mexico State University, Idaho State University, and San Jose State University. He won a Big Sky Championship with the Bengals in 2012-13 and helped NMSU to their first postseason appearance since 1994 in 2009-10. Most recently Giannotti was the head girls basketball coach at Wasatch Academy in Mount Pleasant, Utah. Last season the Tigers were the top team in the 2A District, finishing with a 23-3 overall record. Three of Giannotti’s players were named to the All-State team including Emanuely de Oliveira, Nataly Dunka, and Kysha Barbel. Oliveira has since signed to play basketball at the University of Florida and Barbel has signed on to play at the University of the Virgin Islands. 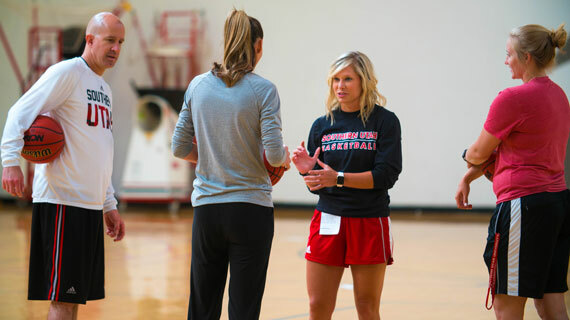 Hailey Mandelko, a former Southern Utah women’s basketball standout, will be returning to Cedar City from Kearney, Nebraska where she served as the head girls basketball coach at Lexington High School. Mandelko was a big part of the 2013-14 Big Sky Champion Lady T-Birds, setting a top-five record for points in a season (467), top-eight record for free throw percentage in a season (84.5%), and earning a Big Sky All-Conference First Team selection in her junior season. Mandelko finished her career as a Thunderbird ranking fifth all-time in points scored (1,225), fourth all-time in free throw percentage (81.3%), and eighth all-time in three-point field goal percentage (35.1%). Mandelko graduated from Southern Utah University in 2015 with a bachelor’s degree in physical education and human performance. “Hailey is one of the greatest players to ever put on a Southern Utah jersey. She is the epitome of hard work and as competitive as they come. She's going to be an unbelievable mentor to our student-athletes,” Sanders said. Jay Johnson most recently held the title of Director of Women’s Basketball Operations at Saint Mary’s College for the 2017-18 season. During his time as DOBO, Johnson’s duties included video coordination as well as social media, details of team management, travel and logistics for road trips, and scheduling the use of facilities for practices both at home and away. “Jay and I have most recently worked together and I have had the chance to watch him transition into a coaching role. He's full of energy and has a great mind for player development,” Sanders said. Johnson attended Saint Mary’s College from 2013-17 and graduated in 2017 with a bachelor’s degree in finance. Stay up to date during the Lady T-Bird Basketball offseason by following @SUUWBasketball on Twitter and Instagram and liking the Southern Utah Women’s Basketball page on Facebook.